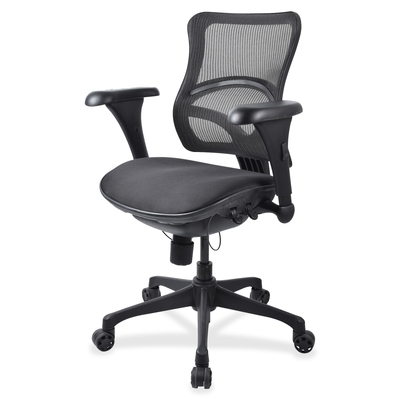 Mid-Back Chair Offers A Breathable Mesh Back That Conforms To Your Body For Better Comfort. Fabric-Upholstered, Cushioned Seat Adjusts 19-7/8" To 23-3/7" In Height And From 18-1/10" To 20-1/10" In Depth To Get Just The Right Position For Optimum Working Conditions. Arms Adjust From 10-3/4" To 13-9/10" In Height. Back Tilt Adjusts In Three Stages. Other Functions Include Pneumatic Seat-Height Adjustment And 360-Degree Swivel. Design Also Includes A 25-3/5" Diameter Five-Star Nylon Base, Black Plastic Frame And 60mm Dual-Wheel Casters For Easy Chair Movement. Weight Capacity Is 250 Lb. Seat Measures 18-1/10" X 18-9/10". Back Size Is 18-1/9" X 17-1/3"..
Mid-Back Chair Offers A Breathable Mesh Back That Conforms To Your Body For Better Comfort. Fabric-Upholstered, Cushioned Seat Adjusts 19-7/8" To 23-3/7" In Height And From 18-1/10" To 20-1/10" In Depth To Get Just The Right Position For Optimum Working Conditions. Arms Adjust From 10-3/4" To 13-9/10" In Height. Back Tilt Adjusts In Three Stages. Other Functions Include Pneumatic Seat-Height Adjustment And 360-Degree Swivel. Design Also Includes A 25-3/5" Diameter Five-Star Nylon Base, Black Plastic Frame And 60mm Dual-Wheel Casters For Easy Chair Movement. Weight Capacity Is 250 Lb. Seat Measures 18-1/10" X 18-9/10". Back Size Is 18-1/9" X 17-1/3".